We updated our Hopper system yet again. We’ve come full circle — we started with one Hopper & 2 Joeys. Now we have one Hopper 3 and two Joey 2.0s. But there’s a big difference between the two — see 1 Hopper 3 RV. This July we upgraded our RV to three DISH Hoppers — each of which is connected to a TV: one in our Living Room, another in the Bedroom, and one in the Basement. We started with 1 Hopper and 2 Joeys, then upgraded to 2 Hoppers and 1 Joey, and finally 3 Hoppers. Lots of tuners — 9 of them with 3 Hoppers, plus lots of DVR recording space (6 TB) and that’s without all the possible external hard drive space. Cost — though the monthly cost of a Hopper is more than a Joey (or a Super Joey), it’s not much more: a Hopper costs $12/month and a Joey costs $7/month to lease. That $5 difference gets you 3 additional tuners and a DVR. Here’s how we did it . . .
A = AB switches (used to switch between rooftop Winegard Travler and portable 1000.4 dish). B = Solo Node (connects 1 Hopper). C = Duo Node (connects up to 2 Hoppers). D = DPP44 Switch (each switch can connect to a Solo or Duo Node). E = DPP44 power supply connection. F = Connection between Solo and Duo Nodes (creates a single network for all 3 Hoppers). In our original Newmar Mountain Aire RV, there was a old-style CRT TV which the previous owner replaced with a flat screen TV. The old CRT TV was housed in a huge cabinet that was no longer needed because the new flat screen TV was hung on the cabinet face. So we filled the old CRT TV space with this (click on a photo to enlarge) . . .
We already had a basement TV but decided to replace it with another flat screen that was brighter as outdoor TVs should be as bright as possible. We also wanted a different TV. Our last TV mount was fixed . . . it held the TV flat. However, outdoor TVs should be able to move in order to avoid glare. 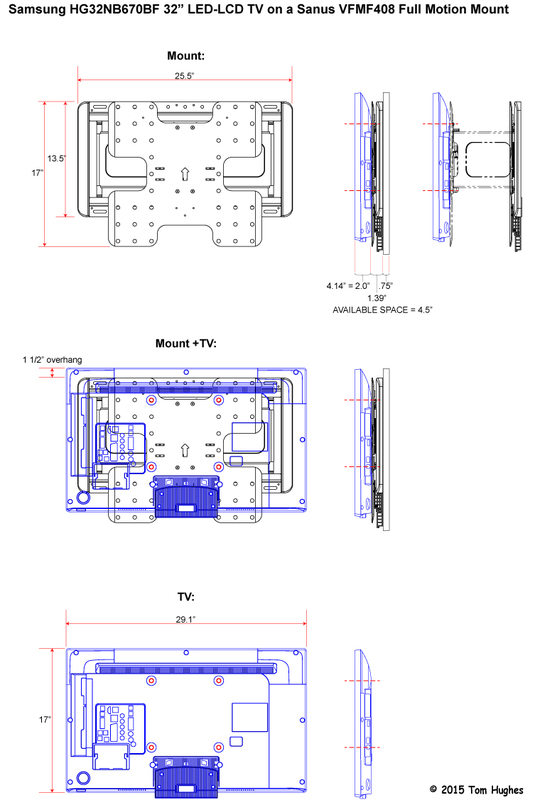 Though the first TV mount, a Sanus, was fixed, it was high quality and we looked at other mounts by the same manufacturer. This time we wanted a movable mount, but it had to be very thin — the RV basement compartment that housed the TV was very narrow. We settled on the Sanus VFMF408 full motion mount which was a thin 1.125 inches deep. Sanus not only supplies install manuals, but also engineering drawings and even install videos. Very impressive. Photos of the actual Sanus/Samsung basement install . . .
After successfully testing the 3 Hopper Network Panel with two of our Hoppers, it was time to hook up and activate our third Hopper (which we bought on eBay). Our other two Hoppers were activated by DISH technicians, so we were a little apprehensive about activating the 3rd Hopper on our own. Satellite Check — the Hopper checks for a valid sat connection from a dish like a 1000.4, Travler, etc. Download Software — the latest software is downloaded automatically. Pair Remote — the handheld remote control is paired with the Hopper, TV, DVR, etc. Name Location — you name your Hopper (“Living Room”, “Bedroom”, etc). Set Video Resolution — the TV’s video resolution. Connectivity — Internet or phone line. This section caused some problems as it was difficult to set up a wireless broadband connection. This may have been caused by the fact that our other two Hoppers were connected during the 3rd Hopper activation process. However, after repeating this part of the setup a few times, Connectivity became green. Authorize Receiver — we thought this would be the scary part because we had to call a “special” DISH phone number to activate the Hopper. Well, the “special” phone number lead to a menu-driven system that sounded just like DISH’s general phone number menu. Anyway, after speaking with a DISH rep, we read them the Receiver and Smart Card numbers, and 15 minutes later our Hopper was activated. Photos from our activation process . . .
Great setup! I am ordering my RV in October for factory pickup in April. They offer a “Winegard Automatic Dome Satellite Dish”, a “Winegard Automatic Open Face Satellite Dish”, and a “Winegard in Motion Dome Satellite Dish” – all for Dish Network. We’re going to have 4 TVs: Bedroom, Living Rm (Large), Living Rm (Small) and Outside. It’s fine with us if LR Large and Outside are paired and Bedroom/Small are paired. We want all-HD, DVR capability, and an external tripod-mounted dish in case we’re parked under trees. We don’t really expect to use the system while in-motion, but don’t have a problem with it. Do you have recommendations as to what equipment we should get? We need to tell them which of the roof-mounted dishes we want, and I would think we need to tell them we need wiring run for the external dish. But what about any switches? What equipment should we order from Dish? I wish there was a place where you could input what you want and it would spit out your configuration!! A 1 Hopper, 3 Joey setup is the most economical and easiest to install system. It allows you to run just 1 coax from a portable dish into your RV. You’ll need 100 – 150 feet of RG6 3GHz coax for the portable. A 2-Hopper system is better because (1) you would have 6 tuners instead of 3 with just a single Hopper and (2) if one Hopper gives up the ghost, the system will work with the remaining Hopper. However, the wiring is more complex — 2 Hopper, 2 Joey system. For the rooftop dish you’ll need a Winegard Travler SK1000 (DISH version). Though you may not need all the wires from the SK1000, have the installers run ALL the wires (control + 3 RG6 wires – “A”, “B”, and “C”) into your RV. For a portable dish, I suggest a 1000.4 Eastern Arc portable dish. Plus, buy the 1000.4 Western Arc LNB for the 1000.4. I strongly suggest contacting a local DISH installer, not DISH directly. I am currently having an issue on my Hopper/Super Joey setup in my Motorhome. I have replaced all the coax with RG6 Quad Coax that has been swept to 3 GHZ. I still have one problem remaining and that is that Hopper Tuner 3 always has a weaker satellite signal (Sometimes 60% weaker on all satellites (110,119,129) and transponders than the remaining 2 Hopper satellite tuners and the 2 Super Joey satellite tuners. Yesterday hopper tuner 3 had 0 signal strength and would not pass the check switch on tuner 3. What do you think is wrong? What type of dish are you using? Do you have a portable dish like a 1000.2 or 1000.4? Do you have an original Hopper or a Hopper with Sling? Do you have it wired similar to this? Well, I figure it’s your Travler, the wiring, or your Hopper. Narrows it down, eh? Since you don’t have a portable dish, you can’t check if it’s your Travler. I’d suggest contacting a local DISH installer — not DISH itself, since they don’t “support” Hoppers in RVs. I finally figured out what is causing tuner 3 on the Hopper to be weaker than the other 4 tuners (2 Hopper & 2 Super Joey). It was the solo node. That was the only piece of hardware that I did not swap out. I tried another hopper with sling and seem the same weak or non-existant signal strength on all 3 satellites/Transponders. It was either swap out the solo node ($21) or the Travler . Thanks for your help. Another question on the 3+ hopper setup, After being told I could not have 2 Hoppers & 2 Super Joeys on a account I tried to have a 3-4 hopper setup on a DISH account and they said I could only have 2 hoppers per account. How did you manage to convince DISH to let you have 3 hoppers per account? 3+ Hoppers . . . DISH will lease you up to two Hoppers . . . after that you have to buy them. I purchased my 3rd Hopper on eBay for about $180 (as opposed to $200+) and self-activated it. Easy. See 3-Hopper RV. 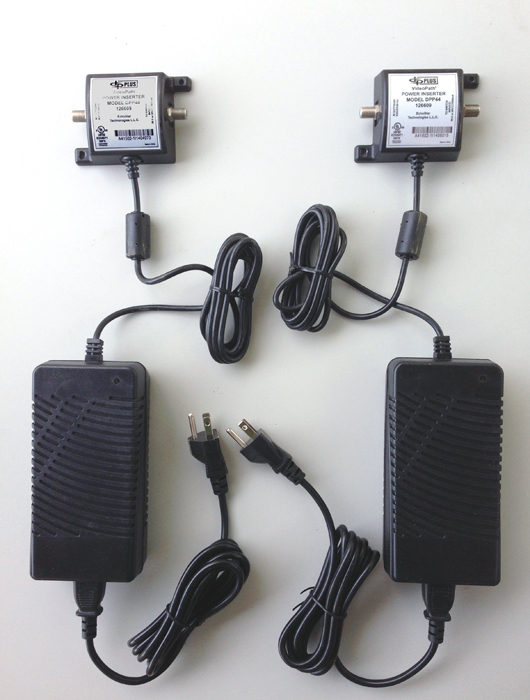 If you can troubleshoot a bad Solo Node, you can definitely network & activate 3 or 4 Hoppers. That’s 9 or 12 tuners! My 3 HopperSling setup would be 3 purchased HopperSlings on one account with no leased HopperSling. I would have 1 HopperSling permanently in the home and 1 HoperSling permanently in the RV. The 3 HopperSling switched between Home and the RV. This would give me 6 tuners for recording/viewing in which ever place I was currently living in. Dish Network told me I could not have more than 2 HopperSlings per account. if I understand you correctly, you are telling me that you have 3 HopperSlings (2 Leased and 1 Purchased) on one account. Did you have to get an exception from Dish Network? I wonder why Dish Network wouldn’t all 3 of the HopperSlings being purchased. DISH will lease up to 2 Hoppers on an account. To add more Hoppers you have to buy them. Some people have 4. So you are saying my configuration is not allowed because I want to purchase all 3 hopperslings? It shouldn’t make a difference. Who’s telling you all this — a DISH phone rep? When I first started upgrading, my approach was 2 HopperSling and 2 Super Joeys on one account. When I called to add them, they told me only 1 HopperSling+1 Super Joey+ N Joeys per account. When I persisted a DISH Phone Rep xfer me to a specialist who said that was correct but that I could have 3 HopperSling per account with special permission. I turned her down because I had already purchased the 2 HopperSling and 2 Super Joey and I fought on with the 2(HopperSling + SuperJoey) combination per account but I finally gave up after talking to various DISH supervisors. When I tried to do the 3 HopperSling configuration per account with the phone rep they said no and would not xfer me to the DISH specialist. That is when I came upon your website when I searched for 3+ Hopper configuration on the internet. Do you have a commercial account (Like for a Sports Bar)? No, I have a regular account. 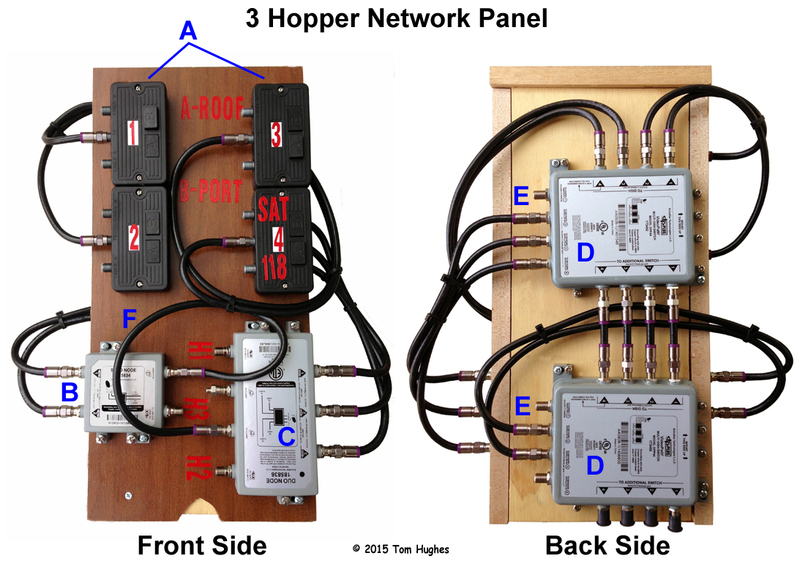 If you want 3 Hoppers in your RV (& Home), have DISH install 1 leased Hopper in your home. Then add the other two on your own. 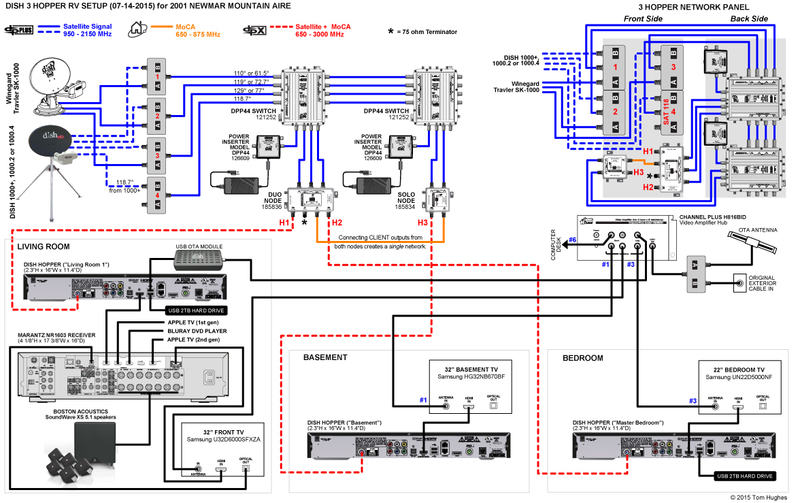 You’ll be responsible for all the wiring & equipment (nodes, DPP44, etc). Go to a local sat installer — not DISH — to have that Hopper installed. First time and I’m a little confused. I was reading the article about how to make the new Hopper 3 work with the Winegard SK-1000 dish and I wanted to ask a question but could find no way to reply at the bottom of the article, perhaps someone in the know could move this to the right spot. Anyway I bought the Hopper 3 and of course the Dish tech could not get it to work, so I came across the article on this site and bingo! it found the satellites and I was setup shortly thereafter. In the meantime I had emailed Winegard who had previously told me I was out of luck and it would not work, suggesting to them that they refer people to this article as it did indeed work. They replied and said the first time I stowed the dish the satellites would not be found next occasion which proved to be true, readout was no LNB. I reread this article and noted that the advice was to disconnect the receiver then let the Winegard find the satellites then reconnect. I did this and after a long search the satellites were found and after reconnecting the coax behind the receiver I had the picture back. So every time we move this procedure has to be followed? Will it work if the receiver is just unplugged instead or is it still getting power from the LNB even when unplugged? Obviously it is a lot easier to unplug than reached behind and fiddle with the co-ax. Apologies for length. So every time we move this procedure has to be followed? Will it work if the receiver is just unplugged instead or is it still getting power from the LNB even when unplugged? Yep, every time you raise or lower the Travler disconnect the Hopper 3. That’s why I suggest using an AB switch between the Hopper 3 and the Travler. I don’t know if unplugging the Hopper 3 will work. Just had a thought, wouldn’t disconnecting the receiver achieve the same result? I have an easy to reach on/off switch which the receiver is connected to at a convenient location. It might work. Try it & let us know. I use a strip power bar where each component that is plugged in has it’s own individual switch. I turned the switch off that the Hopper 3 is plugged into then stowed the dish, when I raised it the satellites were found in a short time. If you are working in confined quarters and it is difficult to reach an A/B switch you may want to consider this approach. I have not tested this by moving the RV, I just tested at the same spot I was parked at.